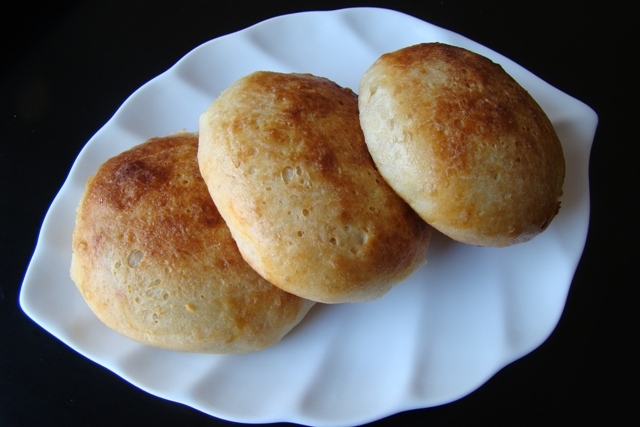 This recipe is incredibly simple to prepare – perfect for yeast and bread-making novices. (Myself included.) The aroma of the dough rising and baking is rich and custardy – barely yeasty. Straight from the oven, these rolls have a thin, crisp crust and a slightly chewy but ethereal body. Versatile and flavorful, they pair equally well with sweet and savory offerings. 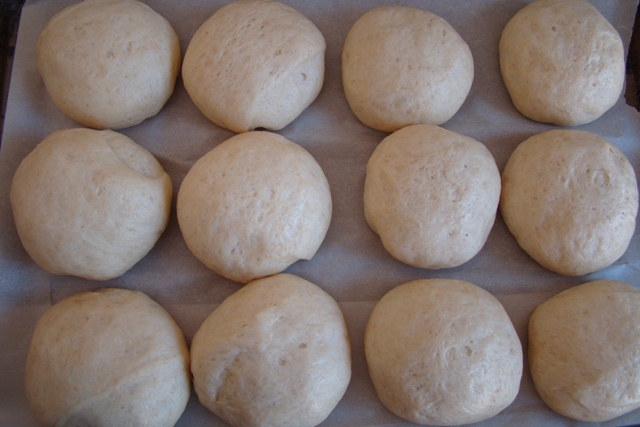 These are our best homemade rolls…. Thus far. Mix together all of the dry ingredients in a large mixing bowl. In a small bowl, lightly beat 1 egg. In a medium-sized saucepan (or microwave), gently heat the buttermilk, the cream and the butter together until just warm. Remove from the heat and stir the warmed liquid until the butter is completely melted. Quickly stir the beaten egg into the warm liquid ingredients then pour over the dry ingredients. Using a wooden spoon, stir the wet into the dry ingredients until all of the dry ingredients are moistened and form a sticky dough. Scrape out onto a floured work surface and, adding more flour as needed, knead the dough for 6 – 8 minutes. The dough should be smooth and elastic and no longer sticky (though not dry). Place the dough in a large, clean, oiled bowl, turning to coat all sides of the dough, cover with plastic wrap and allow to rise for 1 hour until doubled in bulk. Once doubled, scrape the dough back out onto the floured work surface and punch down. Divide into 12 equal pieces and shape each into a ball. 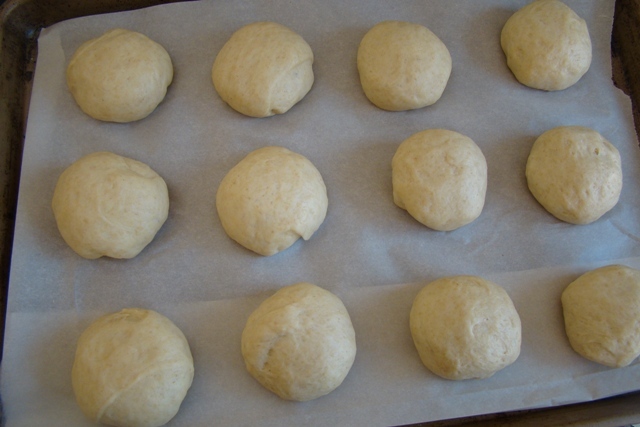 Place the balls of dough in parchment-lined cake tins or baking sheet, spacing them about 1 to ½ inches apart. Cover once more with plastic and allow to rise a second time until doubled, another hour. Brush the tops of the rolls with the egg wash. Bake for about 20 minutes until the tops are golden brown. Rice Kernel used to be a spice fiend. When he was about 18 months old, we ventured to Disneyland with the grandparents. As we sat in a Mexican restaurant, he eagerly ate spoonfuls of chipotle-laced salsa. I tried to take the fiery-hot dip away, but to no avail. After half a dozen bites, however, the giggles faded, replaced by wails. Lesson learned, I thought. No, Rice Kernel wanted more salsa. These days, my almost-3-year-old has a love-hate relationship with spice. He has to be in the mood, I suppose. He has his favorites: salsa, guacamole, and Italian sausage are at the top of the list. Curry, however, is hit or miss. FHE and I are spice fiends ourselves and, while we do not often make curry, it is only because the task seems too laborious. Fortunately, this is a quick, flavorful, and light weeknight option – for the summer nights that require some bold flavors to whet the appetite or the cold winter nights that require the warmth of aromatic spices. Effortless to prepare from mostly pantry ingredients, you can easily substitute your choice of vegetables. Whatever you do, don’t forget a hearty bed of rice to soak up the extra curry sauce. Add the onion and jalapeno (if using) and cook until the onion is tender, about 5-7 minutes. Add curry powder, garlic, and ginger and cook an additional minute, until fragrant. Add the tomatoes, cauliflower, chickpeas and water and and bring to a boil. Reduce the heat and simmer, covered, until the cauliflower (and potatoes, if using) is tender, about 10-15 minutes. Add the carrots and cook until they are just tender and still crisp, about 3-5 minutes. Serve on rice and garnish with cilantro or scallions. These cakes also work well with shrimp, crayfish and even roast chicken. Lightly mix the crab, green onions, chile and cilantro in a bowl and season with salt and freshly ground black pepper. Sift the flour and cornstarch into a separate bowl. Add 2/3 cup cold water and the eggs and whisk until smooth. Stir in the crab mixture and corn kernels. The mixture should have the consistency of heavy cream. Add a drizzle of olive oil to a frying pan set over medium-high heat. Spoon small amounts of the batter onto the griddle and cook for 3 minutes on each side or until golden. Serve with crème fraîche and lime wedges. I am the potato lover in the family. Reds, russets, yukon golds, purple potatoes, yams, sweet potatoes, and, of course, purple yams… I enjoy all edible tubers. As a child, I delighted in mashing them with chicken or turkey and vegetables, a la Irish colcannon. Unfortunately, neither my husband nor Rice Kernel seem to share my love of creamy potatoes. (The little one is getting there.) So when it comes to serving potatoes, I typically incorporate them into hashes or roast them simply with salt, a generous amount of freshly cracked black pepper, and herbs. Looking for a different recipe to prepare some red new potatoes, I came across this preparation. At first glance, I thought to myself, “Potatoes, bread crumbs, and butter?! All that starch and fat!” But I’d be lying if I didn’t say I was intrigued. Days went by. I couldn’t shake the idea of dressing creamy potatoes with crisp bread crumbs. So I rationalized it: I’ll add olive oil and use whole wheat breadcrumbs. That’s a healthy enough makeover. These were a delectable change of pace on our dinner table. With a flavorful roasted crust, the creamy potatoes gain new heights with the addition of nutty brown butter (about 1/3 the amount called for in the original recipe), olive oil, briny capers, and toasty homemade bread crumbs. I assure you it is a savory companion to any roasted meat, poultry, or fish. *Use gluten-free bread if desired. Note: Original recipe calls for 1 stick of butter (no olive oil) and 2 cups of bread crumbs. Adjust accordingly to suit your tastes. Put a 4-sided sheet pan in upper third of oven and preheat oven to 425 degree F.
Cover potatoes with 2 inches water in a 5- to 6-qt pot and add 1 Tbsp salt. Simmer until almost tender, about 10 minutes. Drain potatoes well. While potatoes simmer, heat butter and oil in a small saucepan over medium-low heat, swirling pan occasionally, until browned and fragrant, about 5 minutes. Remove from heat and stir in capers. Keep warm, covered. Toss potatoes with 3 Tbsp caper butter, then spread out in hot sheet pan. 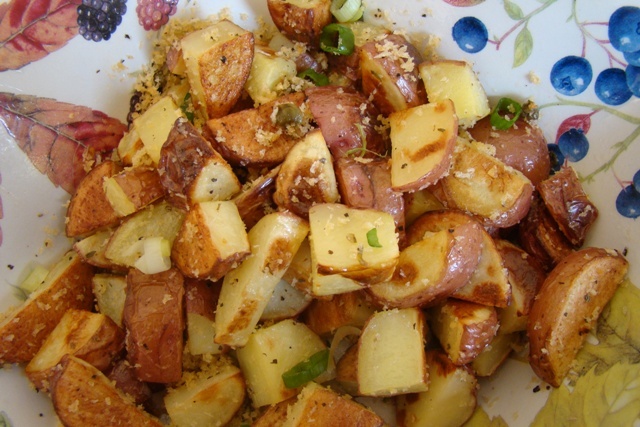 Stir remaining caper butter into bread crumbs and scatter over potatoes. Roast, turning potatoes once or twice, until potatoes are tender and crumbs are golden, about 20 minutes. Season with salt. 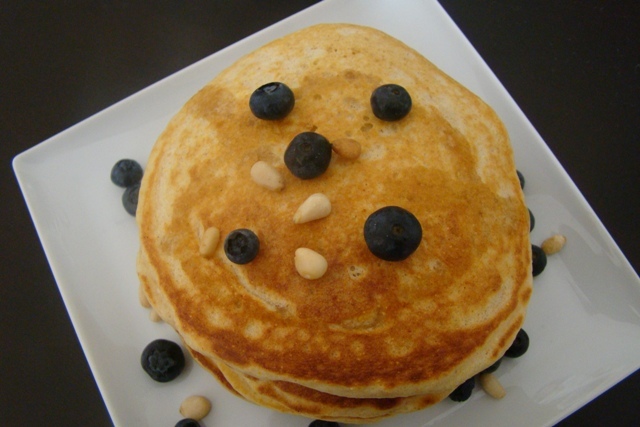 These are light, fluffy, and flavorful buttermilk pancakes with a light cornmeal texture. 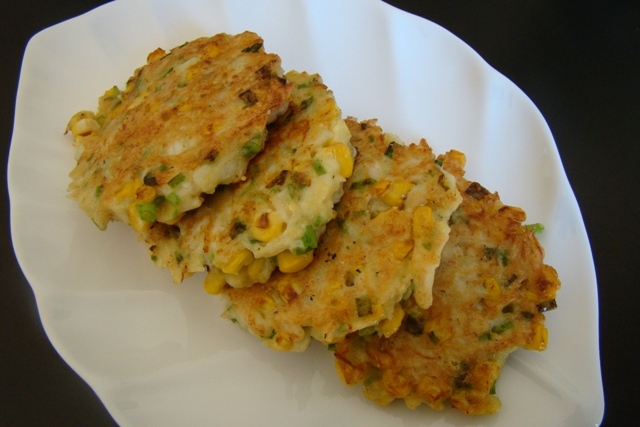 The addition of cornmeal adds body, an irresistibly hearty flavor, and just a hint of crunch. Add some pinenuts or blueberries for additional contrast and flavor. But whatever you do, don’t leave out the honey orange syrup! This glistening, citrus-infused syrup is a beam of sunshine in the morning – and a little goes a long way. Whisk together flours, cornmeal, sugar, baking powder, baking soda and salt. In a separate bowl, whisk together buttermilk, milk, butter and egg. Heat a griddle or large cast iron skillet over medium heat. Grease lightly with butter. Wash an orange and zest completely ( I use a microplane). Juice the orange. In a small pot, whisk together honey and the freshly squeezed orange juice over medium heat. Continue stirring until mixture comes to a boil and the orange juice is completely incorporated. Remove from heat and stir in orange zest. Allow to cool slightly before serving. Sauce will thicken as it cools. Transfer to a jug for serving or a glass jar for storing. 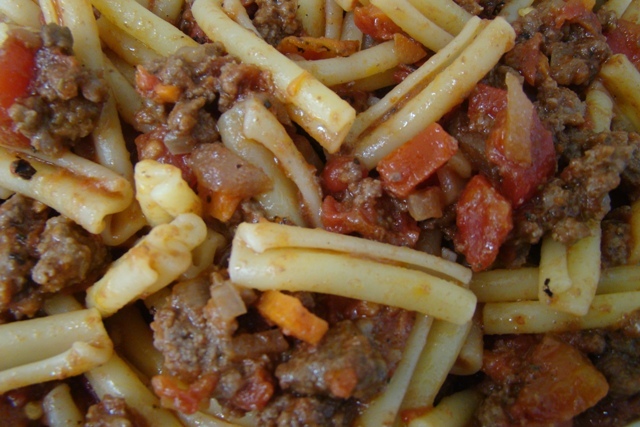 A traditional Bolognese sauce is not simply tomato sauce with ground meat, but one that involves milk and wine and hours of simmering. Just a few ingredients, but the result is a complex, rich blend of flavors with incredible depth. 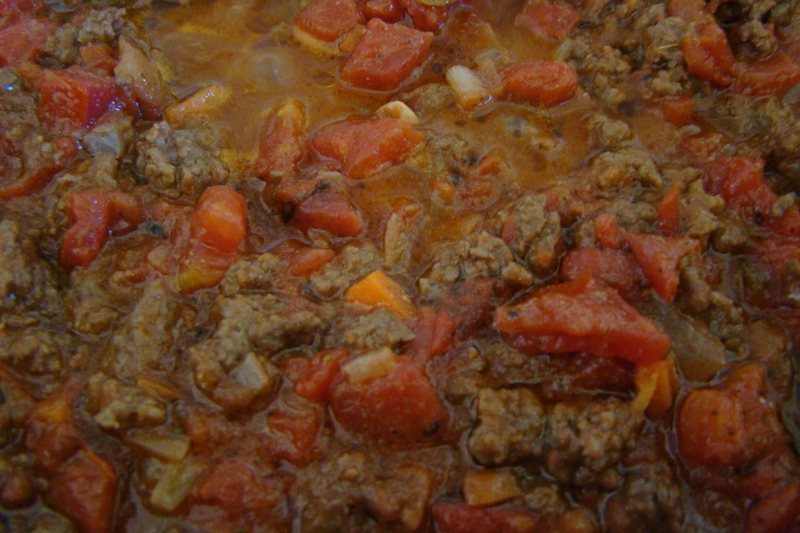 If meat sauce is what you crave, consider making a large batch of this sauce and freezing leftovers for a easy weeknight meal. For us, nothing says homemade or “family dinner” like this. If using whole tomatoes, in blender or food processor, purée tomatoes with juice. Set aside. In large, heavy pot over moderate heat, heat oil. Add pancetta and sauté until golden brown, 5 to 6 minutes. Add beef, pork, and veal and sauté, breaking up meat with back of spoon, until cooked but not browned, 7 to 8 minutes. Add onion and carrot and sauté until vegetables are tender, 5 to 6 minutes. Stir in milk and simmer until milk is clear, about 1 minute. Stir in red wine and simmer, scraping up browned bits stuck to bottom of pan, until liquid is reduced by half, about 5 minutes. Stir in tomatoes, salt, and pepper. Reduce heat to moderately low and simmer, uncovered, stirring occasionally, until liquid is fully absorbed, approximately 45 minutes to 1 hour. In large pot of boiling salted water, cook pasta until almost tender. Drain well and toss with sauce. Eggplant stumps me. My go-to recipe of late has been a savory-sweet red pepper and eggplant confit. I’ve made it so often the boys in my house are losing enthusiasm for peppers and eggplant. But that hasn’t stopped FHE from buying the beautiful purple vegetable – at the market and in the form of two new plants. When I ask him how I should prepare it, he shrugs and states matter-of-factly, “Just stir-fry it with some chicken.” Remember, he’s King of Stir-Fry. Rice Kernel and I are less than impressed about his recipe suggestion. Frankly, I don’t think there are enough lollipops in the world to persuade Rice Kernel to eat stir-fry eggplant. With a bevy of eggplants to cook, my latest recipe inspiration comes from Gourmet Magazine. 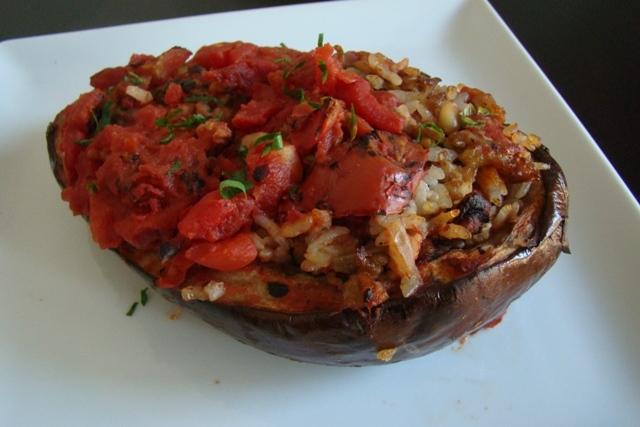 A one-dish meal, the eggplant is stewed (or roasted, my preference) in tomatoes to a silky perfection and flavored with a fragrantly seasoned meat and rice stuffing. It is moist (sorry, don’t let my photo lead you astray) and incredibly flavorful. Rice Kernel and I enjoyed the eggplant itself but the stuffing, flavored with aromatics and sweetened, reduced tomatoes, was truly the star. With hardly a morsel left, there will definitely be an encore. Hollow out each eggplant with a melon-ball cutter, working from bottom end and leaving about 1/3 inch eggplant flesh along interior walls. Rinse rice in a sieve under cold water until water runs clear. Drain well. Heat oil in a 12-inch heavy skillet over medium-high heat until it shimmers. Fry pine nuts, stirring frequently, until golden, about 3 minutes, then transfer with a slotted spoon to a bowl. Sauté onion and garlic, stirring occasionally, until golden, 6 to 8 minutes. Transfer 1/2 cup onion mixture to bowl with pine nuts. Add stock, tomatoes, 3/4 tsp salt, and 1/4 tsp pepper to skillet and simmer, uncovered, while stuffing eggplant. Add rice, meat, allspice, 1 tsp salt, and 1/2 tsp pepper to bowl with onion mixture and mix well with your hands. Stuff eggplant with meat mixture, being careful not to pack tightly (rice will expand during cooking). Transfer stuffed eggplants to skillet with tomato sauce and simmer, covered, carefully turning once, until rice is cooked through, 50 minutes to 1 hour (cut 1 in half to test). Note: I’ve made this dish twice now. The second time, I used pre-cooked rice and simply mixed it with cooked sausage and vegetables. To give the eggplants a head start, I wrapped them in foil and roasted them in the oven for 15 minutes at 350 degrees F. Then I stuffed the eggplants, placed them in a baking dish, added the canned tomatoes and baked for an additional 20 minutes, until fully warmed through.